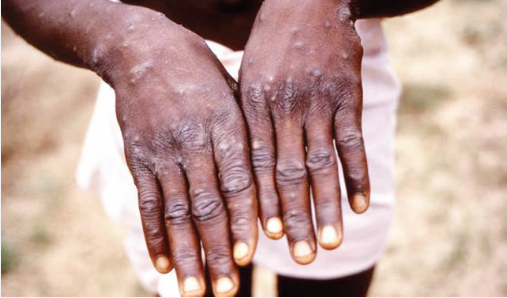 Monkey pox virus occurs when a person comes into contact with the virus from an animal, human, or materials contaminated with the virus. The virus enters the body through broken skin (even if not visible), respiratory tract or the mucous membranes (eyes, nose, or mouth). Animal-to-human transmission may occur by bite or scratch, bush meat preparation, direct contact with body fluids or lesion material, or indirect contact with lesion material, such as through contaminated bedding. Human-to-human transmission is thought to occur primarily through large respiratory droplets. Respiratory droplets generally cannot travel more than a few feet. So prolonged face-to-face contact is required. Other human-to-human methods of transmission include direct contact with body fluids or lesion material, and indirect contact with lesion material, such as through contaminated clothing or linens. Avoid contact with animals that could harbour the virus (including animals that are sick or that have been found dead in areas where the disease occurs). Avoid contact with any material, such as bedding, that has been in contact with a sick animal and solate infected patients from others who could be at risk of infection. Also use personal protective equipment when caring for patients.